I associate February with crazy storms. When I was in grade three our region was hit with the Groundhog Gale, a massive nor’easter that hit on February 2nd, Groundhog Day. As an eight year old it was thrilling. It all started out as a normal school day. Off we walked to our neighbourhood elementary school in a heavy breeze and pelted with rain. Before recess we could see garbage cans being blown down the street and before lunchtime we were told that school was closing due to the storm and we were all to go home. Most of us were walkers so out into the gale we went to make our way home. It was the most thrilling walk of my life. With the wind at our backs we were tossed along the rain coated ice like it was some kind of high-speed carnival ride. We were blown into puddles and hung onto trees to catch our breath. We screamed in delight and took the long way home to prolong the fun. My poor mom hadn’t even been notified that school was closed. 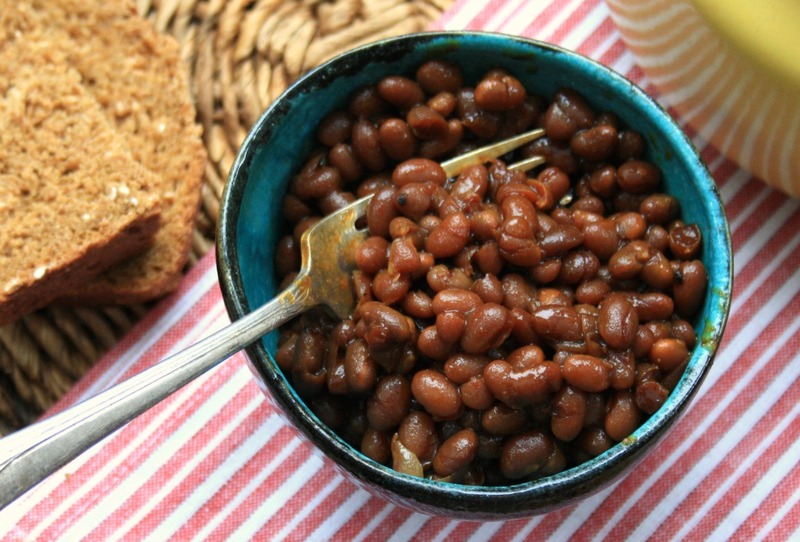 Baked beans are the sort of satisfying meal that helps you weather February storms. 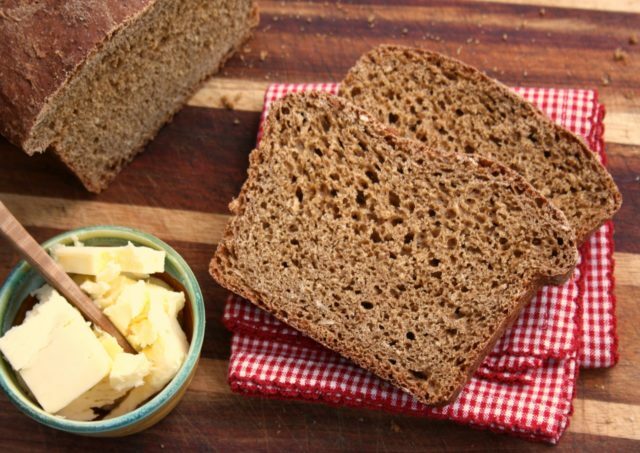 The long baking time keeps the kitchen cozy (although they can be baked in a crockpot) and leftovers can be eaten with breakfast. 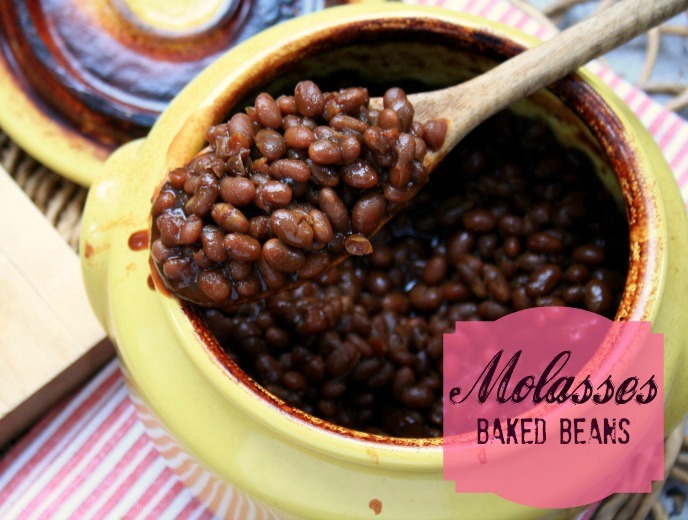 This molasses baked beans recipe the recipe that I grew up with, adapted from The Laura Secord Canadian Cook Book. It has a bit of a bite from the pepper (that’s the sass) to balance the sweetness and develops an amazing depth of flavour. 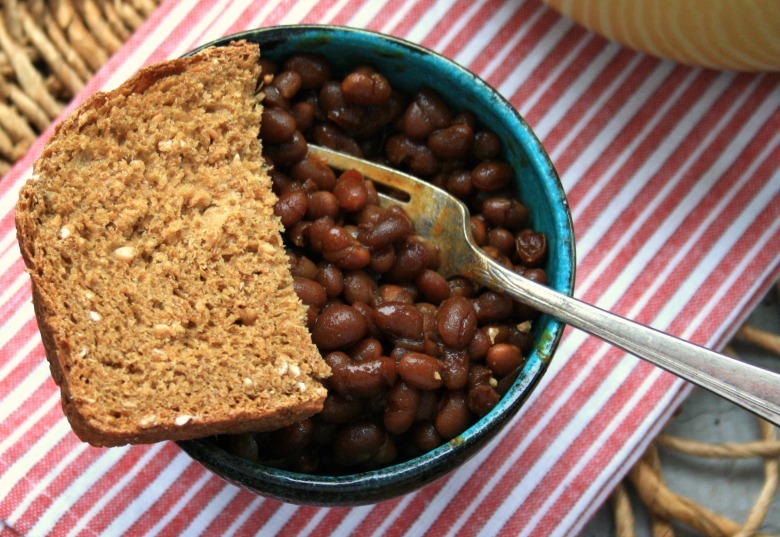 Enjoy these baked beans with oatmeal brown bread , Sarah’s Brown Bread or cracked wheat brown bread. Soak 2 cups of dried navy or white beans in water overnight. The next day, drain the beans, put them in a pot and cover with water. Bring to a boil, and simmer for 30 minutes (or until the skins break when you blow on them). Drain the beans and put them in a large ovenproof pot or bean crock. Bury peeled onion in the middle of the beans. Mix together and pour over the beans: brown sugar, molasses, salt, dry mustard and pepper. Dab with the butter or oil or sprinkle over the bacon pieces. Pour over enough boiling water to just cover the beans. Cover the pot and cook for 4-6 hours, stirring occasionally and adding water if necessary so the beans do not dry out. Take the lid off for the last half hour of cooking. Tasty tips: You can also add half a peeled apple to the mixture along with the onion. 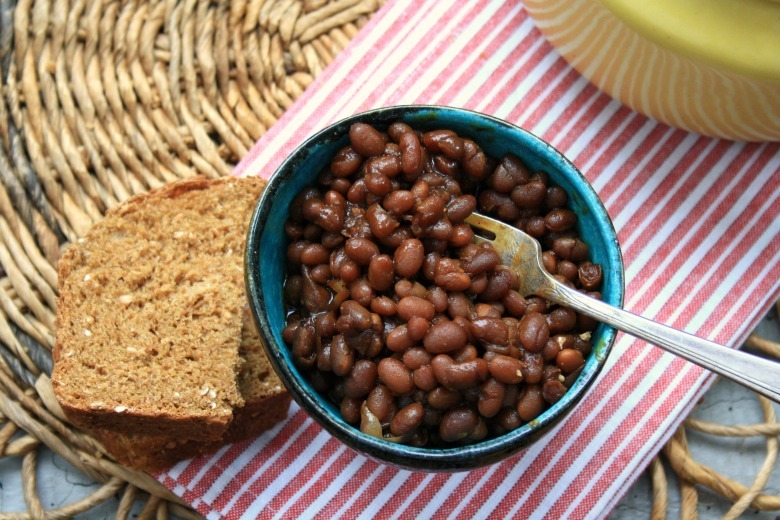 Try adding left over molasses baked beans to your next batch of chili. 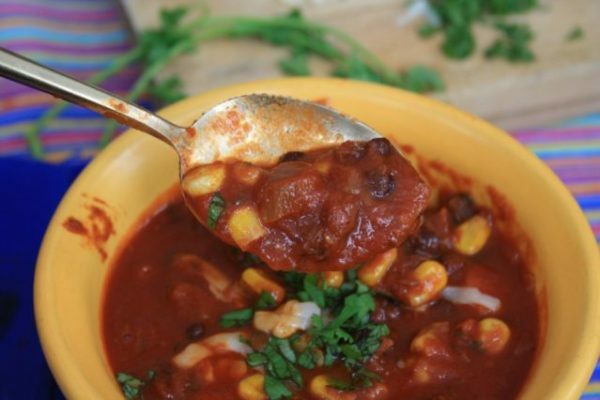 A hearty, healthy chili recipe that’s quick to prepare. I spent my childhood winters up at our local ski hill.  On weekend mornings Dad would pile us in the car with a big picnic lunch and away we’d go for the day. My dad didn’t grow up skiing so he learned to ski alongside all of us kids and I think relished his days on the hill more than we did. My mom would stay put at home and now I know why. There is something lovely about a quiet house on a winter’s day, especially after the early morning rush getting us all out the door. Not only did dad teach himself to ski when he was in his late 30s, he also somehow managed to get us all off the mountain, packed in the car and back home in time for Saturday suppertime mass. We rarely had time to change out of our gear so half of us would still be in our snow pants and ski boots, clomping up the church aisle and into a pew. 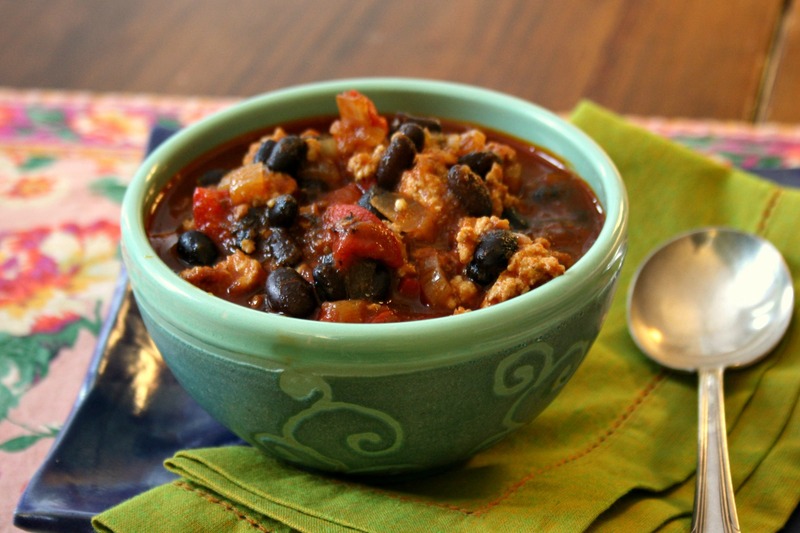 This black bean turkey chili was the sort of supper we’d come home to after these days of skiing. Hot, hearty and served with cornbread or oatmeal brown bread, it’s just the sort of supper that’s perfect after a winter day spent outside. Heat 2 Tbsp. of the oil in a large, heavy pot over medium heat and brown the ground turkey until it is no longer pink. Remove to a bowl. When they’re soft, add garlic, tomato paste and chili powder and stir to combine. Serve with nachos or cornbread and sliced avocado. What kind of food warms you up on a cold winter’s day? 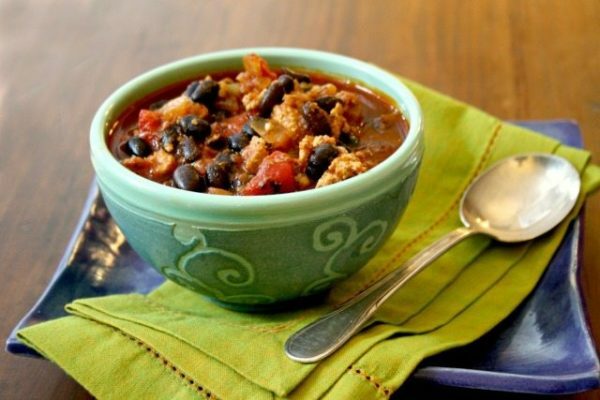 Vegetarian Black Bean Chili is hearty and warming and reminds you that a substantial meal does more than just fill the belly. 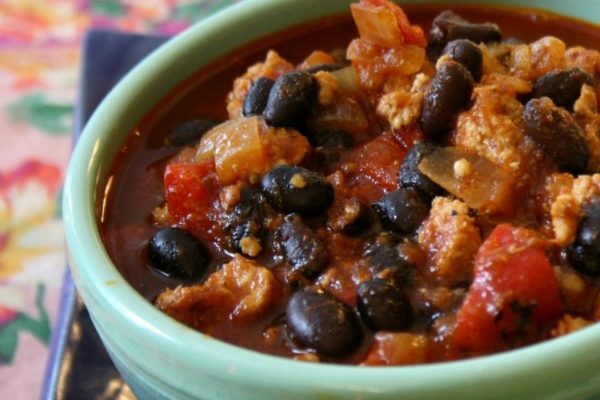 There is nothing that I like better on a cold January night than a big bowl of vegetarian black bean chili. It’s hearty and warming and reminds you that a substantial meal does more than just fill the belly. I was given the idea to add molasses to my chili from one of our Facebook friends who balances the extreme heat and spice of her chili recipe with molasses. I also have a family friend who makes his chili with molasses baked beans so there is a good dose of sweet with the heat in his recipe too. 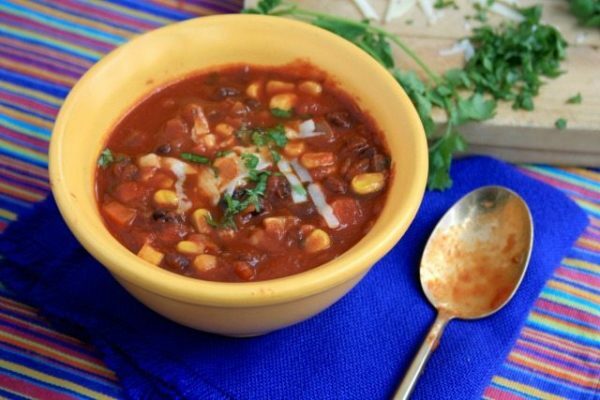 Vegetarian black bean chili is hearty, warming and quick to prepare. 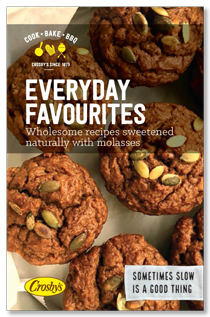 You’ll see that the tangy sweetness of molasses pairs beautifully with tomatoes. It softens their tart acidity and adds flavour with just the right substance. This recipe is vegetarian but works with ground beef or ground turkey as well. Just add a bit more broth or even another can of tomatoes if you find yours too thick. As well, feel free to mix up the beans. 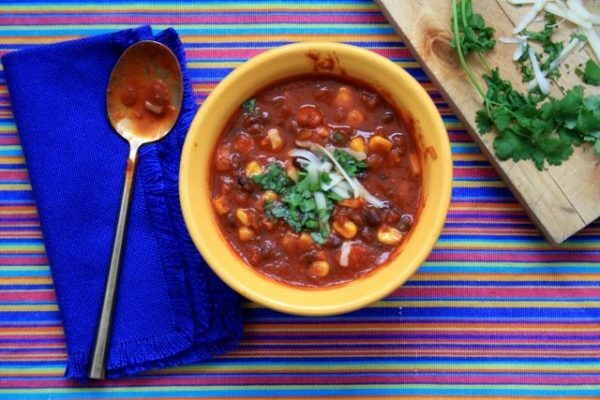 Kidney beans or a blend of beans makes for a great variation. Serve it with this cornbread for a delicious, filling meal. In a big pot over medium heat saute the onions in oil until soft. Add the garlic, spices, oregano and bay leaf and stir for a minute then add the carrots. Cover for 10 minutes, stirring a few times. (Add some of the broth if it seems too dry). Add corn, tomatoes, beans, broth and chipotle (if using) and let simmer, uncovered for about 20 minutes. Stir in the vinegar and molasses. Thin with more broth if it’s too thick for your liking. Add the lime zest and juice and cilantro. Serve with grated cheese and cornbread. Don’t forget to fish out the chipotle chili so nobody eats it whole. 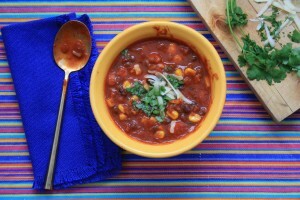 Chili is adaptable so feel free to add any kind of beans or vegetables. Cubed sweet potato or squash are delicious too.